My coworker and I were interested in trying out the different peanut butter alternatives to see the kind of options that are out there for people who may be allergic to peanut butter. Especially now that many schools are declared ‘peanut free’ zones, it will be interesting to see what other options are available. I think that people will be able to tell the difference between the different nut butters. However, I think that the peanut butter and sunflower butter will be similar in taste. I think that almond butter and soy butter will be pretty easy to pick out (although I’m curious how the taste of soy butter compares to peanut butter). Would people choose a different nut butter besides peanut butter if given the option? Well, this was very interesting! Some people could easily identify which samples were peanut butter versus other nut butters and other people couldn’t. Most people found the taste of the sunflower butter too strong, which is very interesting because one of the first experiments we did was peanut butter versus sunflower butter and at that time we thought that they weren’t that different. However, compared to almond butter and soy butter as other possible options, it was obvious how different sunflower butter tastes compared to other nut butters. Most of the taste testers still preferred the taste of regular, creamy peanut butter (not the all-natural). Looks like old habits die hard. With this taste test, it was all about familiarity with people choosing the nut butter they were most used to in terms of taste and texture. Almond butter and soy butter tasted quite similar to peanut butter, so much so, that some people thought that these two butters were actually peanut butter. I actually preferred soy butter over the regular, creamy peanut butter because it was slightly sweeter than peanut butter. Almond butter was also a close runner up. 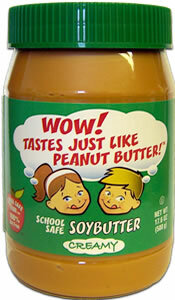 However, if I had to choose a peanut butter substitute, I would choose soy butter. « Battle of the Becels Part 2: Do some perform better in baking than others? » Sugar vs. Sweetener – Would a sugar cookie by any other name taste as sweet? Even though I prefer all natural PB, the regular PB tasted pretty good! Haha! I'm partial to almond butter because I use this at home. So this would be my PB substitute. My least favourite was the sunflower. A: sunbutter. Strong flavour. Can really taste the sunflower seeds. Texture on the bread is similar to PB. Not bad. I don't know if I would like a full sandwich of it but it may just be because I'm not used to the flavour. B:Natural PB. Thick texture. More sticky in the mouth than 'regular' PB. Good flavour. C: Soy butter. Thicker texture compared to PB. Strong flavour. Gritty, odd after taste. Would still be a good alternative to PB in schools if kids will go for it. Not a fan of the flavour. D: Almond butter. Tastes good! Fairly smooth but has small granuals in terms of texture. Good flavour. Moist. E: Regular smooth PB. Not as sticky as natural PB in the mouth. Yummy and delicious, probably because I'm used to it the most due to growing up with this type of PB. Ok I admit I have not had any other butters other than PB and natural PB before this taste test. A- did not really like it. It had an "off" taste to me. B – tasted like a nut but not PB. Tasty. C – tasted good. Guessing not a nut butter. E – This one i believe is PB. Nutty, tasty and creamy :). A. Caramel color but doesn't taste much .. really difficult to assess … I'd say it peanut butter? C. My least favourite .. taste a bit like flour – maybe soy nut butter? I like sample E the best. I think I prefer peanut butter over the other nut butters. I really did not enjoy D but the others were ok! A: I don't like this one. The taste is too strong and it tastes 'off' to me. I think this one might be All-natural peanut butter. B: This one also tastes quite strong and I don't like it. I'm thinking that this one might be sunflower butter or almond butter. (I've never had almond butter so it's hard for me to tell). C: Yummy! I like this one! It tastes a little sweet but doesn't taste quite like sample E which I can tell is real peanut butter. I think this one might be soy butter. D: This one tastes quite different. I can't really say I love or hate it. I'm thinking that one might be All-natural peanut butter or soy butter.